July came and went in a blink of the eye. August will likely go just as quickly and then all we’ll hear about for the next few months is that dreaded word Christmas. I’ve already seen promotions from a hotel and a local restaurant even though some people have only just headed off for their summer holiday. I know retailers in the UK have been moaning about low sales because of the crap summer weather so far but it’s depressing how the commercial world seems intent on pushing the Christmas season earlier and earlier. I’m going to turn a blind eye to it all and just focus on the month ahead. So as a new month begins this is a bit of a wrap up of what’s I’ve been reading recently and what I’m planning or the month ahead. July was a good month during which I managed to read 4 books for the #20booksofsummer challenge and make a little space in the TBR pile. It’s taken me a few years to get around to reading Sheri Fink’s Five Days at Memorial. (reviewed here). The subject matter made it challenging but it was worth the effort – the issues raised by Fink about medical ethics during times of disaster have made for some heated discussions among friends and relatives. I also read the wonderful Bel Canto by Ann Patchett -my first experience of her writing but I know it will not the be the last. July saw the completion of two Booker prize winners – Last Orders by Graham Swift and The Life & Times of Michael K by J. M Coetzee. I had planned to read to short story collections but so far have managed just one of them – The Thing Around My Neck by Chimamanda Adichie with the help of advice in response to my question on how to approach a collection of short stories. Most people recommended I read them in bite size pieces which helped hugely. I have two books on the go at the moment. Tree of Life: A Novel of the Caribbean is a 1992 novel by the Guadeloupean writer, Maryse Condé. It’s the story of three generations of one family and their rise from poverty against a backdrop of racial tension and world events like the construction of the Panama Canal and World War 1. It’s my choice for #womeninliterature month. I’m about a third of the way through and finding it OK but not that engaging. Certainly not as riveting as my other read which is Moskva by Jack Grimwood. Set in the 1980s it features a British intelligence officer sent to Moscow to avoid an investigation over his actions in Northern Ireland. Shortly after his arrival he gets roped in to help find the Ambassador’s daughter who has gone missing. This is a page turner that was highlighted by the Daily Telegraph as one of the best crime novels of 2016. If it’s August then it has to be AllAugust/AllVirago of which I’ll be reading A Favourite of the Gods by Sybille Bedford and posting a few reviews for Viragos I read earlier in the summer but haven’t got around to reviewing yet. I have a few NetGalley review copies requiring my attention including The Sleeping World by Gabrielle Lucille Fuentes which is set in 1970s post-Franco Spain and The Explosion Chronicles by Yan Lianke. What comes after that I haven’t yet decided since I don’t like making detailed plans which feel constraining. There’ll certainly be a Booker title in the mix but I know I’m not going to get around to making much of an impression on the 2016 longlist other than reading some samples of each title. How to read short story collections? My list of titles for 20booksofsummer includes two short story collections. The Thing Around my Neck is a collection by Chimamanda Ngozi Adichie that I picked up in the Oxfam stand at the Hay Festival. At a library sale I found a copy of An Elegy for Easterly by the Zimbabwean writer Petina Gappah which earned her the Guardian first book award in 2009. Both have been on my ‘to read’ pile for about three years so I thought it was time to pay them some attention. Problem is that I’ve never been much of a fan of short stories. I’ve read only one other collection so I don’t know how best to approach reading these two books. I’m hoping those of you who are more regular readers of this form can come up with some recommendations on how to get the most out of reading the collections. Do I start at the beginning and just work through the stories in the order in which they appear? Or do I begin with the titular story on the basis that this could have special significance – was it chosen because it sets the tone for the collection perhaps? Or do I just choose randomly? Is it best to dip in and out of the collection, mixing it up with another book? If I do that I’m concerned I might lose the flow but then if I just read one after the other will they start to blur into one? So far I’ve just glanced over both of these books and have liked what I’ve seen so far. I don’t want to spoil the experience. All advice will be welcomed. The in/out debate over UK’s membership of the European Union is nothing compared to my own debate on whether to join the Twenty Books of Summer Challenge. I’ve been in a quandary ever since Cathy at 746 books announced the challenge is about to begin. “Out” says the rational part of my brain which knows that a) I have no hope in hell of reading 20 books in three months and b) I don’t do all that well with reading to a list. “In” screams the emotional side of my brain which argues that it sounds like a lot of fun. Maybe it was the influence of today’s sunshine but the two sides seem to have reached a point where they agree to disagree and have signed a compromise pledge allowing me 50% participation. Step forward the “BookerTalk not the 20 books of summer list” whereby I read just 10 books. Which means I join in with the fun but have none of the angst if I don’t make it. And just to give further protection, right brain has allowed me to pick more than 10 books so I don’t feel the need to go off piste. My list is a mixture, mainly of Booker Prize titles (still trying to get that challenge completed by year end), short story collections and Viragos. With the exception of the first two, they are all part of my TBR collection. I’ve loved O’Farrell’s work ever since a friend gave me The Disappearing Act of Esme Lemmox so of course when I learned she had a new novel out (that the Guardian newspaper called “technically dazzling”, I immediately got my name on the library reservation list. Good news is it’s arrived just in time for me to make this the first one I read for the challenge. This is a new title in the British Library Crime Classic series. I have an advanced copy via NetGalley. It was first published in 1864 and is said to be the first novel in British fiction to feature a professional female detective. Smith is someone I’ve long felt I should get to know better. Her last novel “How to be Both” was stunning so I’d like to read some of her back catalogue. I just happen to have NW on the bookshelves. Thirkell’s name keeps cropping up amongst bloggers but I’ve never read her. This is probably one of the least demanding of the books on my list. A Virago copy I picked up in a charity shop. Should be good for the All August All Virago themed reading month. Another Virago. In fact the first Virago I ever read. I was fairly young at the time. Will it hold my attention as much the second time around? The Old Devils by Kingsley Amis. My third and final Booker winner, from 1983. This will be the third Coetzee book for me to read. The previous two have been superb. Hope this makes it a hat trick. I’m guilty here of the ‘save if for a rainy day’ syndrome. 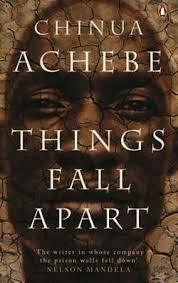 I am eking out Adichie’s work because it’s so good but now I have only Half a Yellow Sun left to read. I somehow don’t want to start it because then it will be over. Stupid I know. In the meantime I shall enjoy this collection of her short stories that I picked up on my first visit to the Hay Festival Oxfam shop. Another short story collection, this time from a Zimbabwean author. Gappah made the 2016 Baileys Prize longlist with her novel, The Book of Memory, becoming the first author from her country to reach this stage of the award. I regularly ask work colleagues for recommendations of authors from their home country. For Belgium, the name of Amelie Northomb was mentioned regularly and was recommended in the View From Here feature on Belgium. Fear and Trembling is actually set in Japan but is the only one of her works I have. Conde is a French (Guadeloupean) author who was a finalist for the Man Booker international award a few years ago. Tree of Life is a multigenerational story about the emergence of the West Indian middle class and tells the politics of race and immigration, and the legacy of colonialism in the Caribbean. It will be the first book I’ve read by an author from that part of the world. So there you have it. 13 titles that should keep me quiet over the summer months. If I do make it to 10 I’ll consider it a miracle but the fun isn’t really whether I make it – it’s the getting there. A monthly round up of what I’m reading, watching etc on the first Sunday of each month. I know, I know this is late. We’re halfway through June and here I am writing a post that should have been done on the first of the month. I did start it, honestly – but things just got in the way. I’ve had one of those months where I have seen the insides of too many airport terminals and hotel rooms. And despite best intentions, I’ve found that being away from home is just not conducive to writing book reviews and blog posts (as much as I love my iPad, it’s not really set up for lots of typing). Enough of the excuses, here’s what I was doing on the first of the month. Reluctantly, June 1 saw me reading Wind in the Willows for the June book club meeting. This was a book I enjoyed when I was knee high to a grasshopper and I loved the National Theatre stage version I saw in the late 1990s. But my tastes have changed and I just couldn’t get enthused by this book at all. Maybe it was just the passage of time, maybe it was the fact that the story was just too familiar or the fact I don’t like books featuring talking animals. Whatever the reason, I found I got to page 50 and simply had no appetite for reading any further. I was also reading Americanah by Chimimanda Adichie, an absolutely exquisite novel. The MOOC course I started (though never finished) on Roman architecture whetted my appetite for more insights about the Empire. One of my birthday gifts was a collection of DVDs featuring Professor Mary Beard, Professor of Classics at Cambridge University. I’ve started on the three part series Meet the Romans with Mary Beard in which she looks at how ordinary people lived in Rome. Her presentation style is informal (not for her the serious look to camera approach beloved of academic presenters in years go by) as she cycles along the Appian Way or sweeps some of the mosaics in Osteria. It’s a style that takes a little getting used to but well worth doing so because, boy does she know her stuff and how to put it across in a way that you can understand even without the benefit of years of classical education. I wish I had her with me some years ago when we walked around the Forum in Rome, impressed by its scale but clueless as to the significance of what we were actually seeing. Prof Beard can look at an inscription on a tomb or a monument and make the people it commemorates come alive. I’m now looking forward to the next DVD which is about Pompeii. Prof Beard has a very good blog at http://timesonline.typepad.com/dons_life/ .Even if you are not interested in history it’s worth looking at since she talks often about reading and the study of literature. On the iPod to accompany me in the gym or in the car is a novel by an author I’d not encountered until a few months ago and even then it was purely via audiobooks. Peter James is a British film producer and author of crime fiction including the detective Roy Grace series set in his home town of Brighton. I’ve listened to two so far, and am now part way through a third – Dead Tomorrow. I like the way he uses multiple narrative strands which run in parallel initially but converge over time. The plots also seem a cut above a lot of crime fiction because they raise some social issues – so for example, Dead Tomorrow deals with the sensitive issue of the shortage of organs through donor programs which forces some severely sick people to take drastic, and illegal action. The one thing I don’t like is the romance interest between the detective and his fiancé which always seems to feature some less than credible dialogue. Stick to the crime please Mr James! This year’s Hay Literary Festival kicks off in Wales next weekend. Last year was my first experience of this event which started with a few people around a kitchen table and is now one of the biggest events of its kind in the UK. I’ll be heading for the festival site nestling in the Welsh hills on the final Sunday of the event. Anyone else planning to be there?? 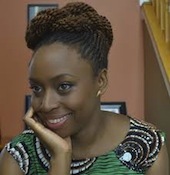 There are just so many tempting speakers on offer again this year, it was hard to decide between them but there was one stand out speaker on the program for me – Nigerian author Chimamanda Ngozi Adichie. I heard a talk with her on BBC Radio 4 last year, not long after her third novel Americanah was published to great acclaim which made me wonder why it’s taken me so long to get to read her work. Her appearance at Hay is just the impetus I need to rectify that situation. 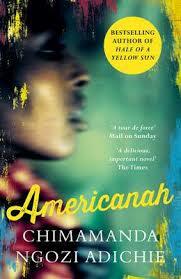 I’ve also persuaded my book group to make Americanah our choice for July. Quite a few members were very keen having enjoyed her Orange-prize winning second novel Half a Yellow Sun but a number of others were not that enthusiastic when they saw how many pages they’d have to read. There seems a reluctance to read anything longer than about 350 pages – I don’t know whether that’s just this group’s preference or whether it happens with other groups also where people think they won’t have enough time to read a long book by the next meeting. The other event I’ll be attending is a discussion with the theatre and film director Richard Eyre who, amongst his many credits, is the man responsible for the magnificent Hollow Crown series of filmed versions of Shakespeare’s history plays. He’s going to be talking about the significance of the plays from Shakespeare’s second historical tetralogy, Richard II, Henry IV, Part I and 2 and and Henry V within the overall body of the Bard’s work and their role in our understanding of Britain’s identity. I’m hoping I can squeeze in a third event if possible as well as a little mooch around the tea shops and second hand shops in Hay itself. I may even get tempted enough to buy a few new books ……..